Spring convocation Waterloo campus ceremonies will take place June 10 - 14, 2019. All ceremonies will be hosted in the Lazaridis Hall Auditorium. Confirm with your graduate the date and time of their ceremony. Please note that tickets are required for guests to attend and may only be claimed by the graduate. Information about how to claim tickets will be sent directly to graduates and is available in Step 4 of our Guide to Graduating. Doors will open one hour prior to the ceremony, at which time guests are invited to select their seats. Parking is limited so we recommend that you carpool if possible. If needed, your student can request accessible seating and parking for the ceremony when securing your tickets. If you have any questions or concerns feel free to contact us at convocation@wlu.ca or 519.884.0710 x3139. If you are from out of town, the Region of Waterloo's "Where To Stay" page has a list of available accommodations for you to explore. Ceremonies are typically 60 - 90 minutes in length. Guest without tickets are welcome to watch the ceremony online or in the adjacent viewing room. Parking will be available free of charge on campus. We do recommend that you carpool as parking is limited. Doors will open one hour prior to the ceremony’s start time for guests to select their seats. Guests for whom accessible seating has been arranged are asked to arrive 15 minutes prior to doors opening and check in at Guest Services. Guest Services is located on the first floor of Lazaridis Hall. Giftware, grad rings and Laurier clothing can be purchased through the Laurier Bookstore. Flowers, grad rings and other memorabilia will be available for purchase at the facility. Degree frames may be pre-ordered or purchased on the day of convocation. Proceeds on frames purchased day-of help to support student programming and event. Following the ceremonies volunteers from the Student Alumni Association will be present to offer complimentary degree framing on site; direct any questions to saa@wlu.ca. 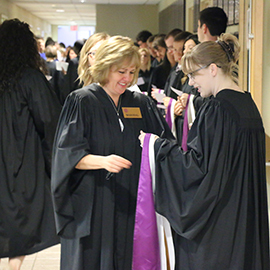 Convocation ceremonies will be streamed live. Visit our photography page for important information about photography. Receptions will be hosted in the Lazaridis Hall atrium following each ceremony for students and their guests to enjoy light refreshments and celebrate their time at Laurier. Graduates, family and friends are all encouraged to attend the celebratory receptions.